One of my favorite trails is the long route from Mt. Malipunyo to Manabu Peak. 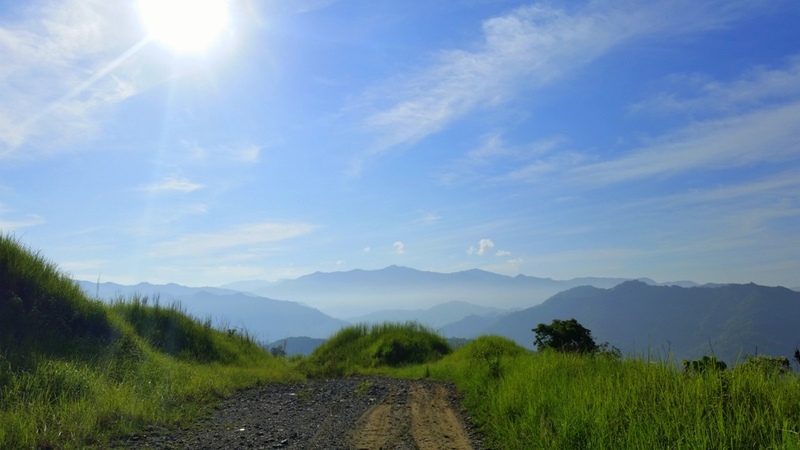 Both mountains are in Batangas and frequented by local hikers on weekends. If hiked on separate days, Mt. Malipunyo takes about 4 hours to reach the summit (IT here) while getting to Manabu's summit (IT here) takes approximately 2 hours. The trail features several highlights : reaching the summit of Mt. 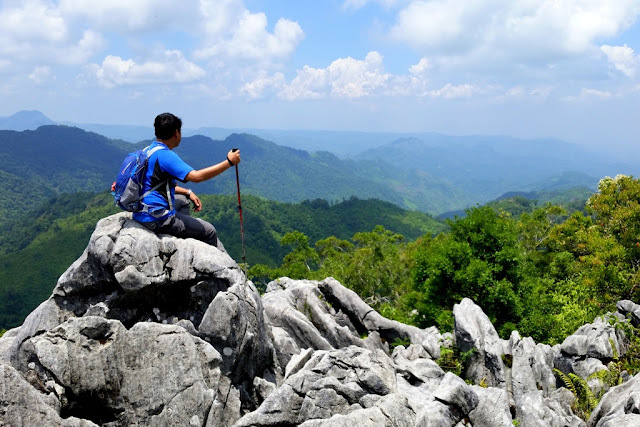 Malipunyo, stop-over at Biak na Bundok's beautiful view deck, getting to Manabu Peak and lastly, a visit to Tata Tino, an old man living in a hut near the summit who offers free Alamid coffee to hikers. 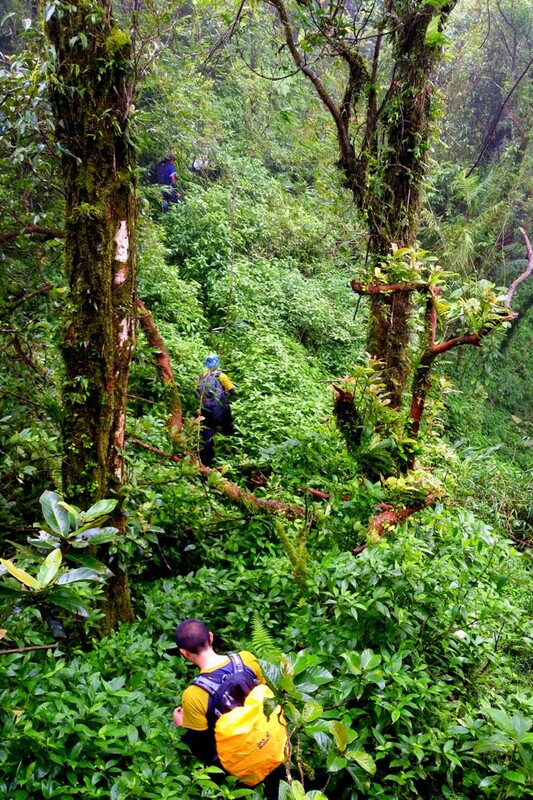 The trail passes through a labyrinth of tall trees and plants. It can get very slippery especially after rain and is steep on some parts. Lipa, a plant that cause itching on contact is also present on the way up Mt. 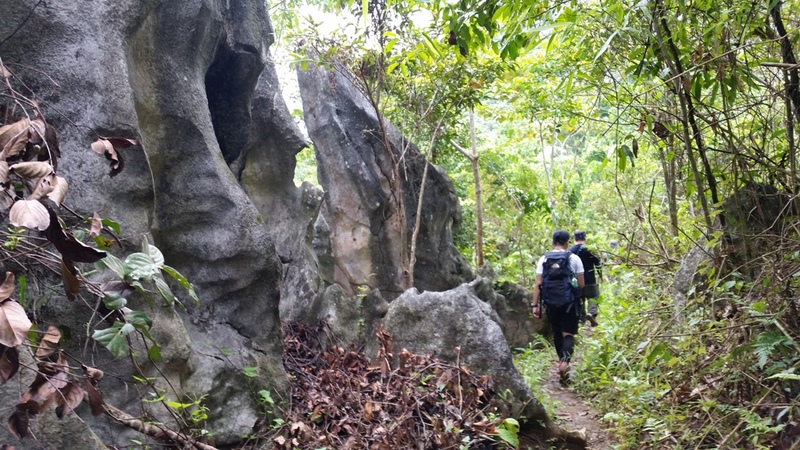 Malipunyo until a portion of the traverse. 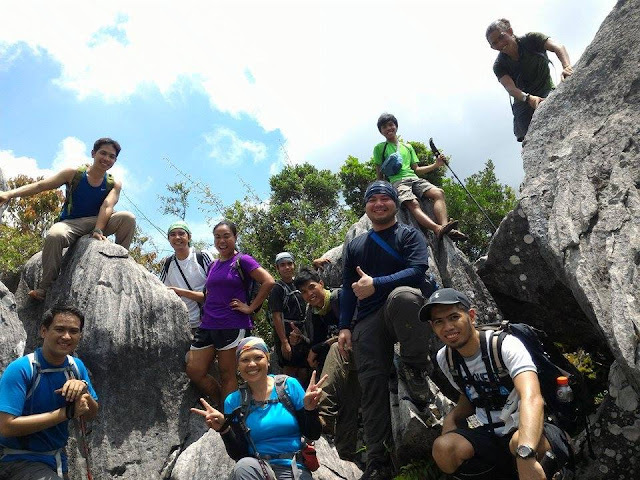 (A discussion on Lipa plants + first aid treatment is on Pinoy Mountaineer. Mt. Malipunyo's summit which I've visited twice has not allowed me to see any views at all. Supposedly, you can see other mountains in Batangas and Laguna. However, in both times, fog obscured the scenery. It was also very windy and cold so we only stayed for several minutes. 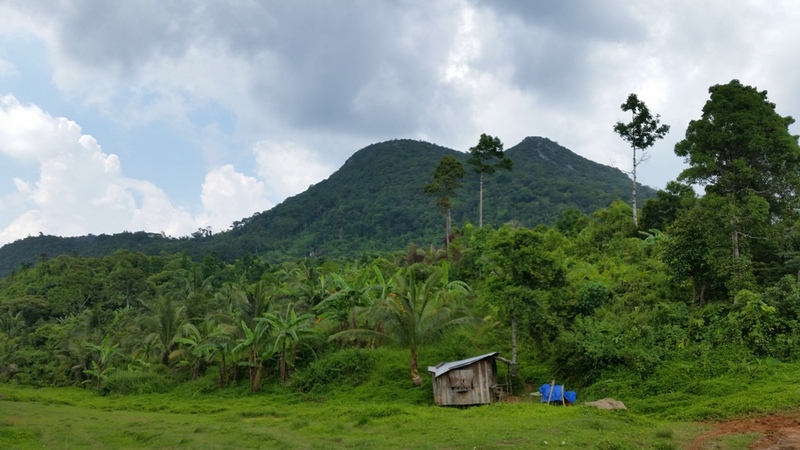 The second major stop - which for me, has the most remarkable viewpoint in the entire route is Biak na Bundok. "Biak" in Tagalog means a crack or gap. Our guide Kuya Mario told us that there was a plan to create a highway that was supposed to connect Lipa, Batangas to San Pablo, Laguna. However, it was not completed, leaving behind a partially eroded mountain. Tall grasses have grown since and you'll hardly notice traces of the abandoned project. From Biak na Bundok, trail continues for 2-3 hours towards the summit of Manabu. You'll pass an open area with grasses almost as tall as you so wearing long sleeves or arm sleeves is advised. It can get very hot on this part when the sun's up. The summit of Manabu is marked with a large white cross. It offers views of other mountains and nearby towns but it often gets foggy in the afternoon. The last highlight of this route is visiting Tata Tino's hut, located 20 minutes from the summit. 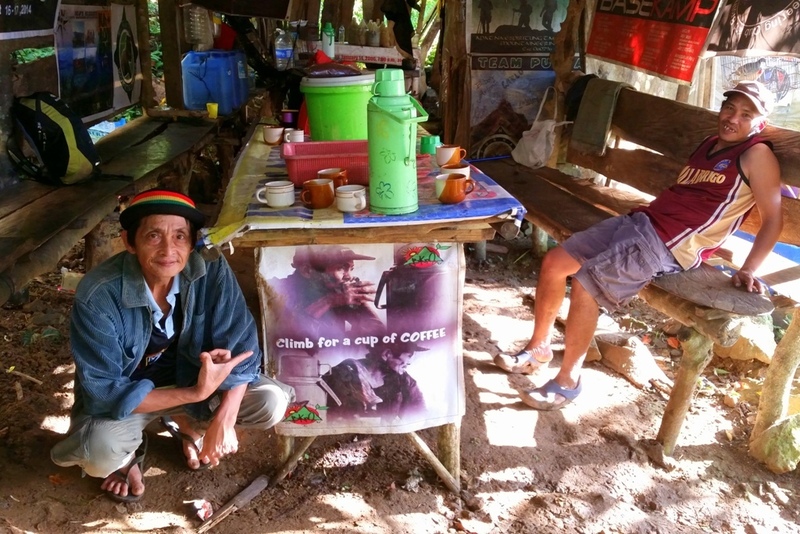 He generously offers freshly brewed coffee and chats with passing hikers which is why most consider this a mandatory stop. The coffee he serves is aromatic and strong. I consume around 2-3 cups on each visit so I buy some beans after as a gesture of gratitude for his generosity. The ground beans are worth your money too. 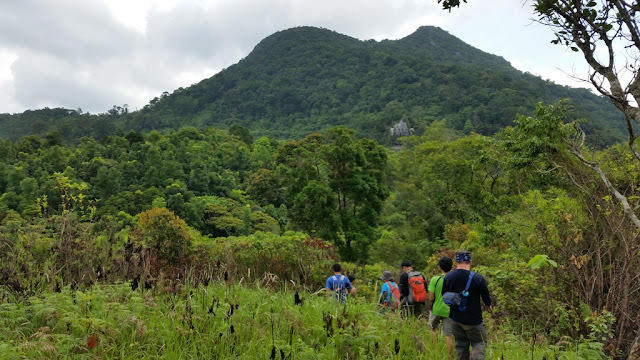 From Tata Tino's hut back down, the trail is easy and quicker to descend as it's mostly downhill but it can be a bit slippery especially after rain. The jump-off at Sulok has several restrooms where you can enjoy a cold bath after a long hike. You'll be passing the city of Lipa on the way back to Manila. Here, you can find various joints where you can eat lomi, a type of noodle soup dish with a thick sauce Batangas is known for. I prefer to eat rice after a hike and often crave for comfort food so my go-to place Bigg's Diner in SM Lipa. It's a leading food chain in Bicol with just two branches in the Southern Tagalog region so I make it a point to eat here whenever I'm in the area. I love their interiors more than anything, an American retro theme. Menu is mostly American dishes catering to the Filipino palate. I wish their serving sizes are bigger though. :P I often end up ordering a chicken meal with rice and then a burger. Hehe! Here's a copy of our itinerary. Hike was last December 2014. 07:30AM - Arrive at the river, first water source. *Thanks to Franz Sandoval for preparing this. 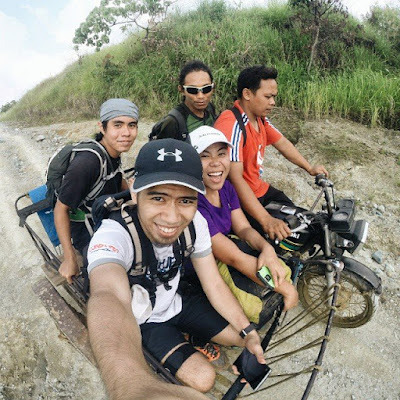 I did the same route with other friends in 2012 and blogged about our experience here. 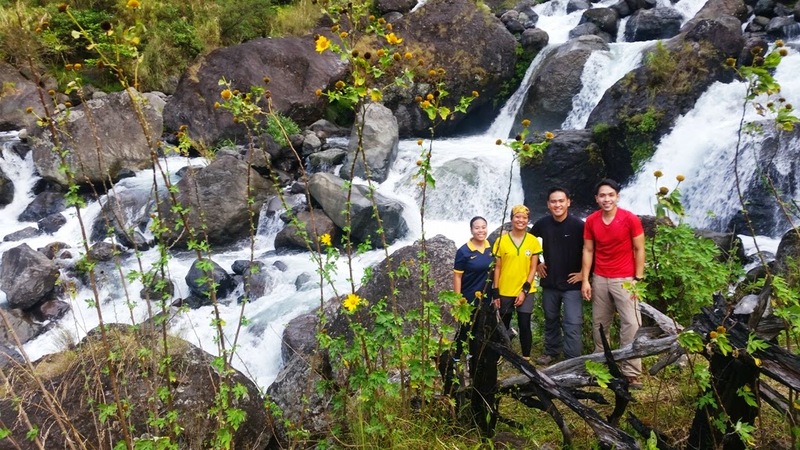 Last week, I joined friends for a quick hike in Rodriguez, Rizal. With the exception of Koi Grey, who had explored the mountain a few years earlier, it was everyone's first time to this fairly new outdoor destination, Mt. Lubog. The origin of its name is unconfirmed but there's a similar word in Tagalog which means submerged, an irony for a mountain that's 955+ MASL high. From Manila, we traveled in a hired van and picked up some members of the group along the way. It was past 9:00 AM when we finally arrived in Barangay San Rafael in Rodriguez where we had to transfer to motorbikes. The barangay hall is beside the public market where you can buy some food and water. A few blocks away is a bakery and just across the street is an eatery where some of us grabbed breakfast. After getting our stuff from the van, 11 of us split into three tricycles with very intriguing frames. Its front seat was made of stripped rubber while the seat at the back was just a wooden plank. There are no roof or walls like the usual tricycles I'm accustomed to seeing around the streets of Manila. By 9:40 AM, we were on our way to the jump-off in Barangay Puray. We were told ride would take two hours and so I braised myself for a long uneventful journey. 30 minutes into the ride, it got very exciting as we traveled on a steep dirt road. It rained the night before so it was wet and slippery on most parts. 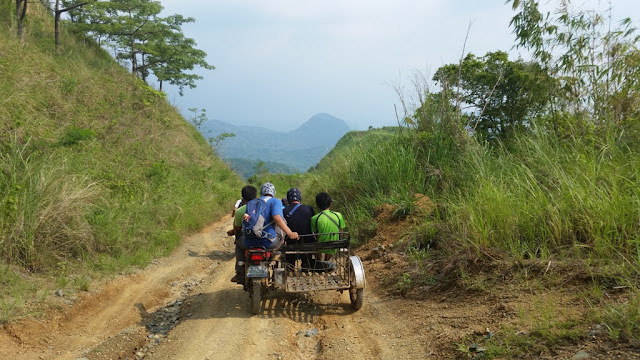 I could not count the number of times we had to go down as the trike couldn't handle the terrain with us on it. Other friends on board a separate trike had to go down twice as much as we did as their driver has not passed the route in a while so he had a little difficulty navigating on the tougher sections. I sat in front beside another friend which gave us a full view of the action. I felt the struggle of the tires on parts that were quite technical and required precise maneuvering. Our bodies rocked in different directions. My hands, gripped tightly on the rope in front of me which served as barriers so we won't fall off. If you saw the way I held on to this section of the bike,you'd think I was holding on the last piece of bacon on earth. :P Later on, we were advised by the drivers to just go with the thrust of the bike and not to cling too hard. The views as we made our way up were stunning and it truly made up all that muscle jolting we had to go through. One of the areas where we stopped for a break. Barangay Puray where we had to register is located at around 600 MASL so imagine the steep sections we had to tackle! It took nearly two hours to get there including all the time we stopped for a break and hopped in and out of the bike whenever it got stuck. After registering, we traveled another 45 minutes. By the time we reached the jump-off, some of us were already tired and we snacked on bignay and grapes before we started our hike. The start of the trek was on a small hill where wild grasses grew abundantly. Yellow flowers, which looked like little sunflowers where everywhere, complimenting the color of the sky which was as blue as the ocean. The entire hike was relatively easy. The trail was just occasionally steep and it only got challenging when we had to pass over slippery sections. I glanced frequently on the ground as there were a lot of rocks and branches. What was particularly amusing about this route are the huge rock formations that can be seen almost the entire way. This was the first time I've seen such trail. Foliage is thick, enormous trees that stretch to the sky can also be seen. For a nature-lover like me, seeing all these was gratifying enough. one of the enormous rock formations can be seen all the way to the peak. After 90 minutes hiking on a relaxed pace, we arrived at the summit. I could hear my companions who were in front exclaiming what a beautiful sight it was. When I emerged from the trail and finally saw the summit, I too was impressed. Limestone rock formation covered the summit. It is clean and fortunately, no vandals on the rocks. I hope it stays the same way. There is no flat ground so we each picked a spot, joking and giving names to the boulders which can only fit one person. We took a lot of time ingesting the view since the hike was just quick and we badly needed to recharge ourselves for the motorbike ride back to Barangay San Rafael. :P I was not looking forward to it. Group shot at the summit. As this is a short hike, other side trips can also be done to maximize the travel. Lubog cave is along the trail. It is located at the first rest area and can be explored in 15 minutes. You can also take a dip at Panintingan Falls which is 20 minutes on foot from the jump-off. Being pressed for time, we decided to skip both places. The ride back to San Rafael was mostly downhill which was quicker. We only got down around 2 or 3 times when our bike got stuck in the mud. We washed up at the Barangay hall in San Rafael and traveled to UP Town Center in Quezon City for a hearty early dinner. Even if the hike was short and easy, the bike ride was even more challenging. My back and arms were sore and I felt as though we hiked the entire day. The newly-opened branch of Kyochon has an attentive and welcoming staff. Considering we ordered around 60 pieces of wings and drumsticks (all spicy, gah!) and 3 salads, service time was quick too. Hehe! Chicken coating was crunch and tasty, its flavor extended to its meat. It's delicious albeit too spicy for my taste. The rice is quite memorable too - it's fluffy and moist - exactly the way I want it. 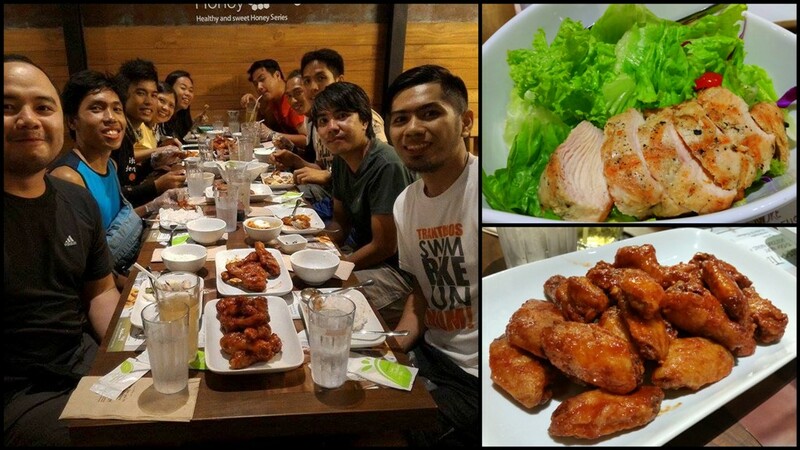 :) After consuming an obscene amount of chicken, I haven't craved for chicken since (it's been a week since that hike and I still don't feel like eating chicken :P). We paid 1,100 Pesos each for the trip inclusive of van rental, guide and registration fees. 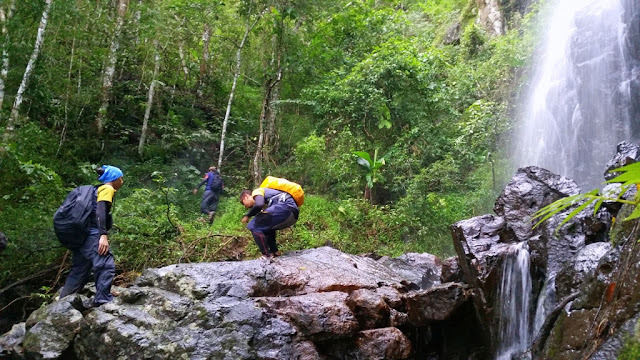 Visit Pinoy Mountaineer for details on getting here via public transpo. - My water supply for this trip was around 1.2 ML (750 ML water, 500 ML Gatorade). Thanks to Brent Tan, a new friend from Trail Adventours for organizing everything and to blogger Leeisure for the helpful details she posted which helped me decide on what to pack for the hike. Her account on Mt. Lubog is here.